Do you find yourself throwing tons of parties and renting kegs on a normal basis? You probably end up wasting a good amount of the beer in the keg because it goes warm before someone can drink it. Buying a kegerator will solve all of those problems. These kegerator reviews will show why it is important to use a kegerator when renting a keg or even buying a keg and getting it filled. When it comes to kegerator reviews, you want to make sure you get the best of the best before spending a good amount of money. There are certain things you want to look for when searching for the best kegerator. The first thing to take into consideration is the size of the kegerator. This one in particular measures 21.25 inches deep, 25.25 inches wide and 47.25 inches high. The next thing to look for is what size kegs it is compatible with. You can use multiple sized kegs with this kegerator. You will be able to fit s ¼ barrel, 5 gallon, 5 gallon D system and ½ barrel sized kegs. This means no matter what size of keg you decide to rent for the weekend or the week, you will be able to store it in your own kegerator and keep it cool and fresh for much longer than usual. The exterior also matters when looking for the best kegerator. This one has a black finish with a stainless steel door. There are casters on the bottom to make it extremely mobile and easy to transport. The tap and drip tray unit are on top of the kegerator and are surrounded by a chrome guard rail. This gives it a sleek and sophisticated look and feel. You can even adjust the temperature from 34 degrees all the way to 40 degrees. If you are not using it as a kegerator, you can convert it to a regular mini-fridge. There are 2 internal wire shelves included with this kit. EdgeStar has created a simple kegerator that is meant to get the job done. It was made to hold the kegs, keep them cold, and dispense them from the tap on the top of the kegerator. One of the best things about this kegerator is the fact that it is on wheels. When you buy this kegerator, you have to assemble it yourself but it is very quick and easy. There aren’t too many parts that need to be put together by hand. You will get the box that holds the keg, the door, wheels, safety rail, tap, drip tray and the CO2 tank. One of the features that sets this apart from other kegerator reviews is the fact that it comes with the carbon dioxide cylinder that holds 5 lbs. When this kegerator is fully assembled it will be a good size to store in your kitchen. It measures in at 20 inches deep, 24 inches wide and 48 inches high. The height includes the measurements of the tap as well. The safety rail is made from a chrome material and is a great contrast against the black body of this kegerator. It can house the US standard kegs that come in ¼ size and ½ size. This one unfortunately does not hold that Coors or Miller rubberized kegs or the oversized kegs. When you are looking through kegerator reviews, you want to make sure the kegerator is compatible with whatever size or type of keg you are renting. This Nostalgia Electrics kegerator is compatible with 4 different sizes and types of kegs. You can fit a 5-gallon D system keg, 5-gallon Cornelius keg, ¼ barrel pony size keg or even a ½ barrel full size keg in this kegerator. The interior temperature of this machine can be changed anywhere from 33-37 degrees Fahrenheit. 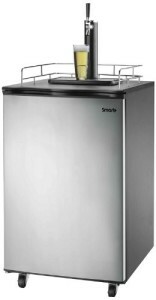 The exterior of the refrigerator unit is solid black with a stainless steel door. The safety guard around the tap is also made of a stainless steel material. The combination of the black and the stainless steel give this kegerator a polished and sophisticated look and feel. Along with the kegerator appliance, you will receive the tap that gets attached to the top and an empty CO2 bottle. The inclusion of the CO2 bottle is great because you won’t have to search for one that fits with this kegerator. All you will have to do is get it filled in order to use the kegerator. The beer tap is spring loaded to make it very easy to use. You won’t want to use a keg ever again without a kegerator once you have use this one. When one tap on a get just is not enough to accommodate your needs, you need to look into other kegerator reviews. 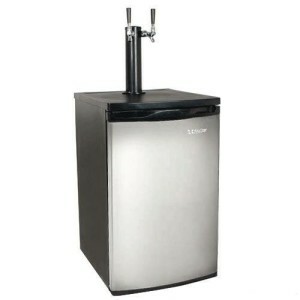 This EdgeStar dual tap kegerator is ideal for someone like you. The price might be a little higher than some of the other kegerators but it will be well worth the money. 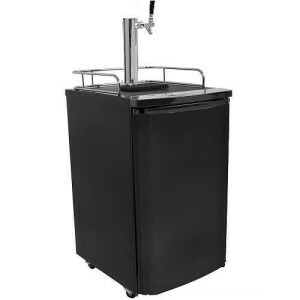 You can now put two different kegs inside this kegerator to give your guests a little variety when it comes to the beer they are drinking. Inside this machine, you can house 2 full half shell Sankey standard kegs or two 1/6 kegs. The only downfall of this kegerator is it cannot hold the Coors, Miller rubberized or other over-sized kegs. 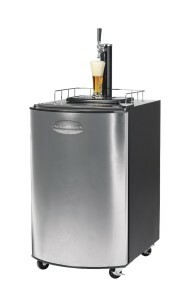 Included with this kegerator is the double tap attachment that sits on top of the machine and a 5 pound CO2 container. It comes empty but it very easy to fill up. You will also get a pressure gauge that is easy to read and rolling casters. When this kegerator is not being used to hold kegs of beer, it can be converted into a mini-fridge. This means this kegerator in particular can serve as 3 different appliances in one. You can use it as a single kegerator, dual tap kegerator or a simple mini fridge. The door is also reversible to make it easier to accommodate to your home. The temperature inside can range from high 30’s to mid 40’s. If you are reading kegerator reviews to look for the best kegerator out there, this might fulfill your needs. This Haier kegerator comes with 2 American “D” System Sankey lever handle couplers. This means you can put two kegs that are compatible with this lever system inside the machine and serve two different types of beer at the same time. This will keep your guests happy and entertained the entire time they are there. These kegerators will keep your beer fresh ad cold for up to 3 months. That is much longer than if you were to just stick the keg in a bucket with ice. You don’t have to worry about wasting money on beer that is wasted anymore. This kegerator in particular can hold ½ barrel kegs, full size kegs, ¼ barrel kegs and pony kegs. The possibilities are almost endless. The exterior of this kegerator is completely black. This will look very good in just about any kitchen atmosphere. The corners of this piece of equipment are rounded to give it a little extra style. There is heavy duty casters included so you can easily move this kegerator around the house or even take it outside. For the price, you are essentially getting 2 kegerators in one machine. You will never use anything else after using this kegerator.